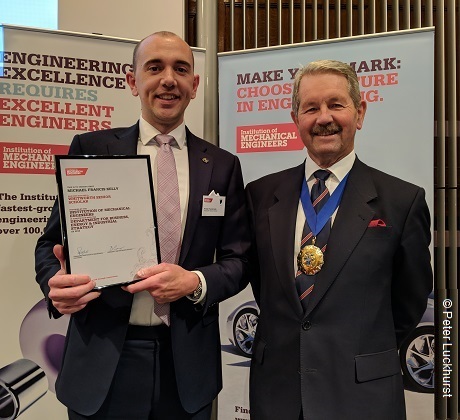 Frazer-Nash Engineer, Michael Kelly, has been presented with the Whitworth Senior Scholar medal by the Institution of Mechanical Engineers (IMechE), in association with the Department for Business, Energy and Industrial Strategy. Engineers who are granted Whitworth Scholarship funding for their studies are eligible for the medal. Candidates' overall achievements are evaluated by an IMechE panel when they complete their studies which, if appropriate, recommends the award of the medal, and the entitlement to use the title 'Whitworth Scholar' and the designatory letters, Wh.Sch. Michael received Whitworth Senior Scholarship Award funding when undertaking his PhD at the University of Liverpool, and was also designated as The Whitworth Visionary 2017. His successes at Liverpool also included the title of 'Best post-graduate teaching assistant in the School of Engineering'; and a William Morgan Scholarship, which enabled him to travel across India before attending an international marine conference in China. Michael's doctoral research looked at the development, validation and integration of air wake predictions for the Queen Elizabeth Class aircraft carriers, to inform First of Class Flight Testing for the Lockheed Martin F-35B Lightning II using the flight simulation facility at BAE Systems Warton. This included working aboard HMS Queen Elizabeth, during her sea trials, to assist with air flow measurements across the flight deck. During his time at Liverpool, he also assisted with the aerodynamic aspects of successful UK land speed record attempts for a human-powered road vehicle. The medal, together with a certificate, was presented to Michael by IMechE president, Tony Roche, at the organisation's headquarters. Each new Whitworth medal is individually crafted for scholars by the Royal Mint, and bears the face of celebrated engineer, Sir Joseph Whitworth, who set up the scholarships in 1868. In receiving this accolade, Michael joins fellow Whitworth Scholar, Paul Deeran, Frazer-Nash Business Director, who received his Whitworth medal in 1994. Sir Joseph Whitworth believed that academic learning should be coupled with hands-on experience, combining the theoretical and the practical. Michael's background demonstrates this, having started his career working as a marine diesel engineer at sea and on land, and serving as an electrician in the Territorial Army. He also undertook internships with marine classification society, Lloyds Register, during his undergraduate degree. Elected Whitworth Scholars include professors, business leaders and innovative engineers across both industry and academia. There are only about 320 living Whitworth Scholars. Fourteen Whitworth Scholars have served as presidents of the Institution of Mechanical Engineers, while 17 have been fellows of the Royal Society. In 1923, the Whitworth Society was founded to provide a support network for all Whitworth Scholars and to promote engineering in the UK.